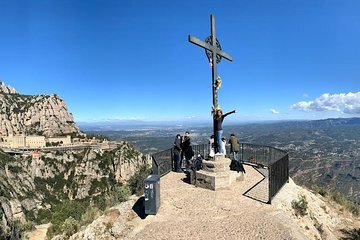 Fuja das ruas urbanas de Barcelona para o ar tranquilo da montanha de Montserrat. Este passeio começa com um passeio confortável da cidade até o mosteiro de Montserrat, com sua famosa Madona Negra. Você viajará de teleférico até o topo da montanha, onde terá a chance de explorar as impressionantes formações rochosas a pé. Nos dias de semana, às 13h, você pode ouvir o famoso coral de meninos do mosteiro. Barbera has a fantastic host and guide. What a great trip to a fantastic place, we arrived early which was well worth the 8.15 start from Barcelona. The atmosphere in the whole place was inspiring, visiting the Black Madona followed by a walk to the cross marking the cave it was found, brilliant. Tranquility, amazing legends, beautiful Nature, spiritual music, real history and a great great guide! This tour was above and beyond our expectations. Since there are lots of tours going to Montserrat, it was difficult for us to chose which one to book. But, now I am completely sure that we made the best choice! Thank you LIVINGIT for making us live such a nice morning! By the way, thanks to our guide for inviting us and letting us taste the mató. Just delicious!